I'd love to see the league start hammering these guys for domestic violence incidents like this the way MLB does steroids. Like, first instance is half a season. Second is a full year. Third is lifetime ban. 27 games is a long time...and I'm assuming he's not getting paid for it, right? I don't know if it's enough or not but I still think that's an attention getting ruling and hopefully deters this type of behavior. Well, the PA is going to contest it and get games knocked down. So it's probably 20. For DV, that's really not enough. That's the same as Schmidt just got for PEDs. The optics of suspending a player who plead no contest to domestic violence the same amount of time as a player who violated a drug test by like a billionth of a percentage is captial B, Bad. Again, if I were the league, I'd take a much harder stance on domestic violence incidents. Schmidt got 20 games...Watson got 27. You're assuming that Watson's will be reduced without the assumption that Schmidt's will be reduced. Watson makes $1,100,000 this season...he'll be losing over $350,000 because of this. It's a fair penalty in my mind. 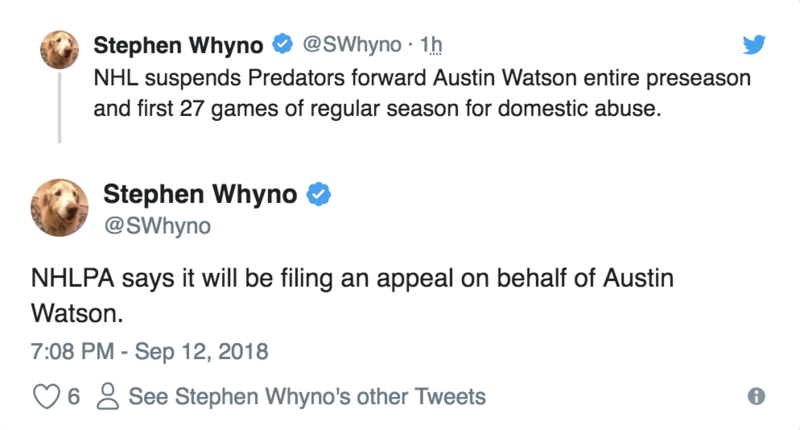 While I agree that the league should be taking a much harder stance on DV, let's not pretend for one second that there's any sort of deterrent factor to be gained from it. Guys who are predisposed to abusing their wife and/or children are not going to think as they raise their fist, "huh...I could get suspended half a season if anyone finds out about this, maybe I should lower my fist..."
In other words, my stance is: once a scumbag, always a scumbag. I also don't believe in rehabilitation efforts as a sidestep for true punishment, in both DV and sexual assault situations. Let's not pretend that this is an illness or a disease like alcoholism. Throw the book at them and get it over with. And by the way, by and large my social views are extremely left-leaning, but DV and sexual assault are two areas where I draw the line as far as softening the penalty. Totally unrelated though, and if anyone wants to debate this, we can take it to another thread. That's not the reason I want harsh punishment for DV. Deterrents don't work, period. Not the death penalty, life in prison, etc. It's about optics and the ability to be taken seriously as a league. If you take an uncompromising position on behavior you will not tolerate (provided that behavior is actually reprehensible), you're winning the PR battle by default, instead of always being on the defensive in trying to justify why a suspension for something horrific is so similar to something that barely registered on your drug test. We see this on headshots, too. So and so gets four games for shaving days/months/years off the quality of life of his peer, while silly technicalities might land another guy (again, let's use Schmidt as the example) on the shelf for a quarter of the season over speciousness. Oh this I definitely agree with. It's hard to even call it a double standard, because it's far worse than that. Utter nonsense can earn you a suspension, but headhunting and taking years off someone's life (and possibly giving them dementia in their 40's) seems to come with a slap on the wrist. It's across the board, too. Everything feels too evenly weighted because the league appears to fear harsher penalties.